The Italian verb for study is the irregular -ARE verb studiare. ... imagine you must study, HARRY! Studiare can also mean: to examine. - studiarsi (vr) : to study oneself, to study each other. - studiato (adj) : studied, carefully prepared, laboured. - studiacchiare (v) : to study fitfully. - il studio (nm) : study, studying; office, practice; research survey. These verbs ending in -iare are irregular because they drop the ii to i in the Present and Present Subjunctive tenses. Verbs conjugated in this way include : assediare, cambiare, annaffiare, espropriare, finanziare, gonfiare, graffiare, imbottigliare, mischiare, studiare. Study new Italian words quickly and recall them easily, learn with memory techniques like Cartoon Memory Triggers. To remember a word, just think of the pic! 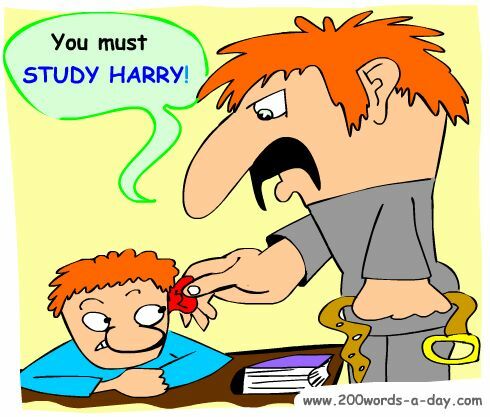 Imagine you must STUDY, HARRY! non studiare! (non) studi! (non) studiamo! (non) studiate! (non) studino! ✔ Studiare is an irregular -ARE verb, these being the most common verbs in Italian. ✔ Learn studiare and it will reinforce the pattern for ALL those other -ARE verbs. ✔ Do the daily verb every day for a month and you will have a solid knowledge of the -ARE verbs' conjugation patterns. Each month a new family of verbs is featured. ✔ There are many more Italian Verb Tables like this one. ✔ YOU can easily add these daily Italian verb lessons to YOUR website - free by copying and pasting some code we give you. ✔ You can more easily remember words and verbs like the Italian for study - studiare using the techniques of the world's Memory Masters. 200 Words a Day! Free Daily Italian Lesson Online - the verb in Italian for study is studiare - fully conjugated. Italian Learning Made Fun and Fast with your free Daily Italian Verb Lesson - studiare.